Originally uploaded by Bushiroad inc. This evening Bushiroad's international branches announced their adoption of Clan Fight regulations, a system of rules that has been implemented in Japan since the release of VG-BT16: Legion of Dragons & Blades. 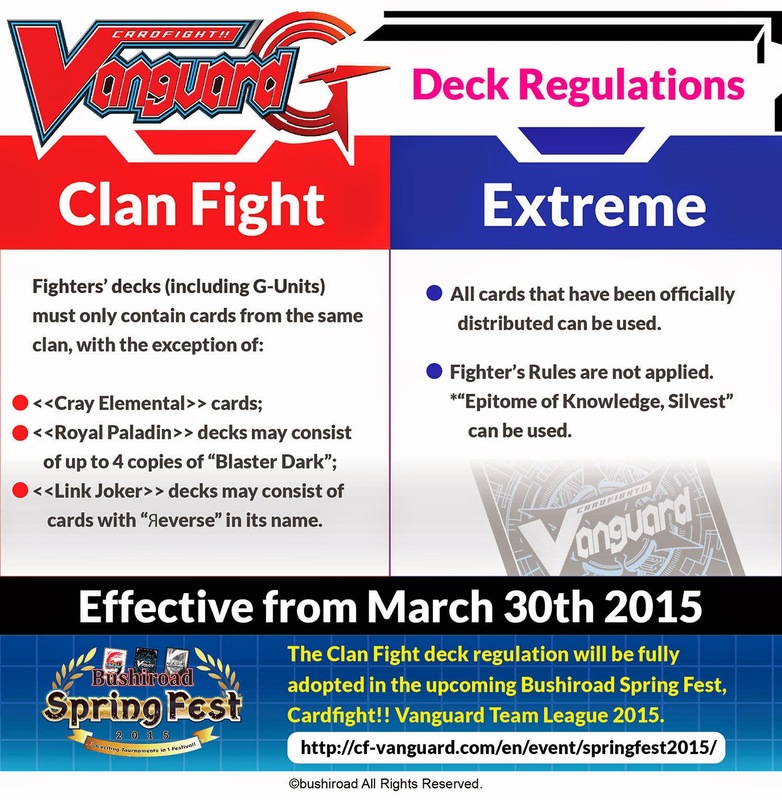 Under these regulations it is against the rules of the game for cardfighters to mix cards of different clans in one deck, with a small pool of exceptions. The rules were originally implemented in Japan because all units printed after TD14: Seeker of Hope do not require same-clan vanguards for their skills to activate, and no grade 3 units from that point onwards have the Lord skill that prevents them from attacking if a unit on the field does not share their clan. The game designers are thus designing cards around the presumption that cardfighters may only use a single clan. Bushiroad's decision was preempted by that of Alter Reality Games, organizers of the 2015 US national championships. ARG had already adopted Clan Fight a week earlier as a result of strong demand from the community. The decision was made following massive player outcry against the results of the Louisville regional qualifier, where half of the top 8 decklists ran the Spike Brothers unit Frozen Ogle while using no other Spike Brothers cards in the decks. Frozen was primarily used in Cat Butler Raizer decks to search for the eponymous grade 0, but also saw play in a mixed Dimension Police deck to bring out Commander Laurel and Mist Ghost. After considering the players' reactions, ARG elected to implement Clan Fight at all of its tournaments beginning on March 8th with the Fort Lauderdale regional qualifier. Extreme Fight, in which clan mixing is permitted, will only be implemented at ARG tournaments as a side event. Bushiroad's move to imitate ARG may be in an effort to salvage the company's official tournament system, which has progressively fallen out of favor with fans as the company as repeatedly failed to introduce best-of-three competition. Some went so far as to doubt that Bushiroad USA and its associated branches would ever implement Clan Fight regulations in light of its slow response to the release of BT16. By contrast, the Japanese branch had implemented Clan Fight from the moment that TD14 was released. While ARG will be officially implementing Clan Fight on March 8th, Bushiroad will not do so until March 30th. One noted difference from the Japanese ruleset is that the English Clan Fight rules permit Link Joker fighters to play units with “Яeverse” in their card name. The Japanese Clan Fight rules instead permit Link Joker fighters to play units with the Я character in their card name, hence permitting Dragonic Overlord “The Яe-birth” to be used. Like with the exception given to Royal Paladin cardfighters being able to use four copies of Blaster Dark for Majesty Lord Blaster, this rule exists to allow a specific deck to function, Star-vader “Ω” Glendios. The English edition rules otherwise closely match the September 29th 2014 Fighter's Rules implemented in Japan, sans the restriction of Cat Butler implemented on August 18th of that year. March 5th, 2015 Update: Bushiroad international has since released additional material identifying “The Яe-birth” as eligible for Link Joker decks.